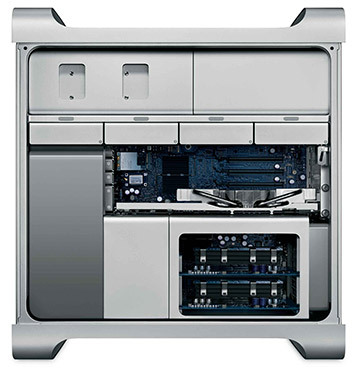 This BTO 'Build to Order' Mac Pro quad core 2.8 (Early 2008) gets it's heartbeat from one 2.8GHz Quad Core 45-nm Intel Xeon E5462 Harpertown/Penryn processor with 12MB of level 2 cache, a 128-bit SSE4 SIMD vector engine and a 1.6GHz 64-bit independent frontside bus. The base factory configuration is 2GB DDR2-800 (PC2-6400) ECC "fully-buffered" FB-DIMM memory. The FBDIMM spec for these models includes large fully finned aluminum heat sinks to provide superior cooling. 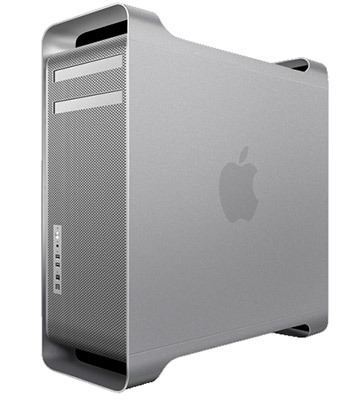 These models also came with a 7200 RPM/8MB cache 3Gb/s 320GB SATA hard drive, a double-layer 16X "SuperDrive" plus an ATI Radeon HD 2600 XT graphics processor running 256MB of GDDR3 RAM and 2 dual-link DVI ports.